n the heels of the global agreement made at COP21, U.S. cities are stepping up and committing to innovative changes through sustainability and smart city strategies. With the help of funding from the federal government and a strategy initiated by Federal initiatives such as the Smart City Challenge and Envision America, cities are setting out to address our aging infrastructure, reduce carbon emissions, enhance economic development through innovation and data-driven ideas to play their role in sustaining our global economy. Urbanization is increasing by some 200,000 residents daily moving into metropolitan areas. They’re seeking enhanced accessibility: to transportation, jobs, healthcare, education, and community. New neighbors mean more stress on our infrastructure but it can also mean the opportunity for innovation. An increasing innovative knowledge base is growing in our nation’s urban areas and that’s beneficial for all walks of life. With new companies, growing university systems and individual citizens, this new intellectual and monetary capital opens up opportunities for collaboration and public, private, plus partnerships. Historic events took place at the end of 2015 in Paris. Sadly terrorists shook the city, and the world, with attacks in an urban neighborhood killing 130 people. Not two weeks later, this proud city hosted the 21st Session of the Conference of Parties (COP 21). Paris proudly pushed on and was not thwarted by this violence. The conference, attended by 196 global parties, negotiated the Paris Agreement, a global agreement on the reduction of climate change. The agreement will become legally binding when 55 of these, which together represent at least 55 percent of global greenhouse emissions, sign the agreement by April 2017. 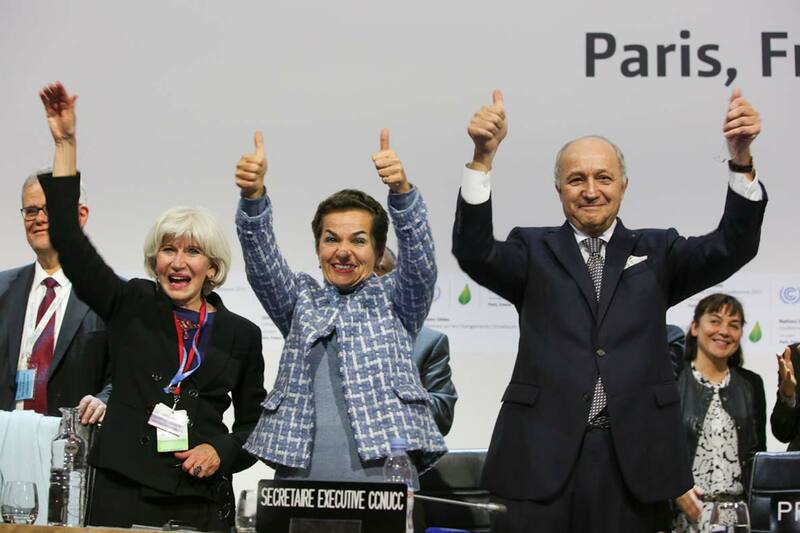 Laurence Tubiana, COP 21/CMP 11 Presidency; UNFCCC Executive Secretary Christiana Figueres; and COP 21/CMP 11 President Laurent Fabius, Foreign Minister, France; celebrate the adoption of the Paris Agreement. Photo courtesy of IISD Reporting Services, 2015. The proposal recognizes that climate change is a common concern of humankind. It “emphasizes with serious concern the urgent need to address the significant gap in terms of global annual emissions of greenhouse gases by 2020 and aggregate emission pathways consistent with holding the increase in the global average temperature to well below 2 °C above pre-industrial levels and pursuing efforts to limit the temperature increase to 1.5 °C.”  The agreement is based on nationally determined contributions that have been communicated by the Parties. These contributions, due April by 2017, are then updated every 5 years creating a long-term sense of accountability. A key component in this agreement is the focus on supporting developing countries through the Adaptation Committee and the Least Developed Countries Expert Group to jointly develop modalities to recognize the adaptation efforts of developing countries. Industrialized nations will expedite support for developing countries for the implementation of policies, projects, and programs. In 2012, transportation sources accounted for 28% of total greenhouse gas emissions. (US EPA). Next to electricity generation, the transportation sector is the second largest emitter of CO2 in the United States. When Envision America hosted its workshop in January, ten cities, who were chosen out of dozens of applications, worked with “leading experts from industry and academia to diagnose needs, workshop solutions, and develop new smart initiatives for their community” White House Smart Cities Press Release. These Smart City initiatives look to address key challenges and seek the most innovative, forward-thinking plans to harness technology “fight crime, foster economic growth, manage the effects of a changing climate, and improving the delivery of city services.” –(President Barack Obama) While all of these ideas address a balancing of technology, economic development, and social justice; all of them will be achieved through federally funded research and collaboration leveraged by public, private, plus partnerships. Some strategies include the inception of Eco-Innovation Districts (Pittsburgh, PA), a community smart microgrid (Milwaukee, WI) and tree canopy initiatives (Los Angeles, CA). What does this all mean in light of the COP21 agreement? These opportunities, tested on a local level, can be replicated and rolled out not only across the U.S. but also help uphold our commitment to support developing nations. In Milwaukee, they are looking at developing a microgrid in their 30th St. Industrial Corridor. 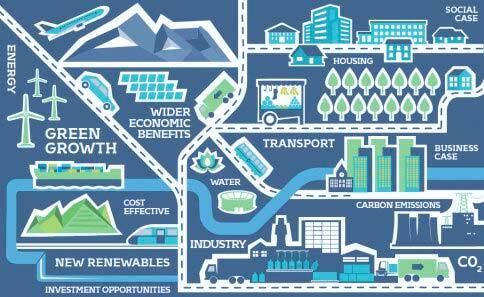 Microgrid systems can increase reliability, reduce carbon emissions and diversify energy resources. Milwaukee has the opportunity to analyze a variety of renewable energy technologies for power generation as well as test smart technologies that allow the consumer more control over consumption. A community microgrid can add stability while making a city more resilient, an important factor dealing with the effects of climate change such as increasing storm intensity and frequency. Diversified generation, reduced consumption, and increased resiliency are all components of a strategy that could be explored with private industry as well as testing and analysis with academic partnerships. 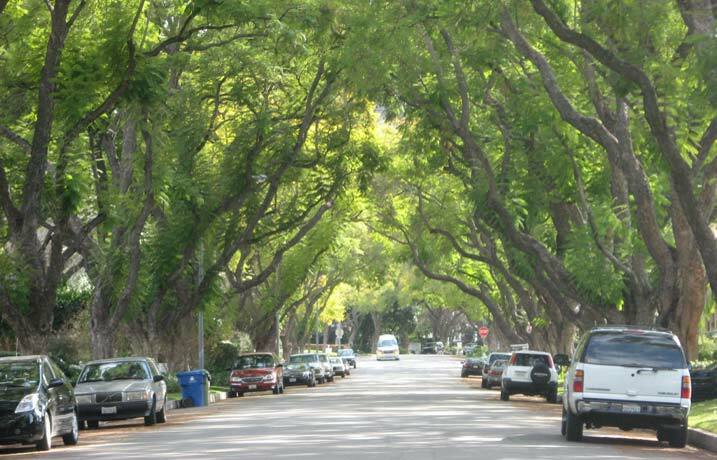 There is an estimate that there are over 10 million trees growing in the City of Los Angeles. Photo courtesy of Los Angeles, Urban Forestry Division. Los Angeles is in the midst of one of the worst droughts in history. In an effort to upgrade their infrastructure, they will need to replace dozens of trees they displace during the process. Vital to not only the reduction of heat island effect, natural air & water filtration but also how important these trees are as assets to the community. In Melbourne, Australia they developed a tree ID system to help with the maintenance of their urban forest. Instead of routine emails regarding damage or disease, residents started writing to the trees through “Leaf Mail”. While locals profess their admiration to their leafy friends, this forest even gets international fan mail from across the globe. I read about this wonderful project and suppose to write you from another side of Earth — Russia. I hope you have a good care and don’t sick. One day we will meet, may be. While LA hopes to incept a similar strategy, the overall impact won’t just be the increase of leafy love letters, it will also decrease the stress on freshwater reserves by reducing stormwater runoff, act as carbon sinks by decreasing emissions and help keep the urban temperatures down by shading heat-absorbing concrete. While LA works to provide the best incubation period for these new trees, it will incorporate innovative technology through smart irrigation systems that monitor and track watering while they grow to sustainable maturation. Eco-Innovation Districts are a hotbed where innovation meets sustainability. The outcome is an economic engine driving entrepreneurship and en vogue neighborhoods. Pittsburgh sees the opportunity but also the challenges accompanied by this type of growth. With sensitivity towards gentrification, they are looking to enhance an area of ‘Uptown’ with equitable economic opportunities and sustainable development. This urban strategy will balance the load of increased population with mitigating sustainability strategies such as green infrastructure, smart meters, and accessibility. Many people are still figuring out what the new COP21 outcomes will ultimately heed. Sustainable Development and Smart City strategies will certainly play a leading role in support of this agreement. Innovative approaches and increasing collaboration through public, private, plus partnerships allow us to work together to solve some of our greatest challenges. Working together in our communities and cities are great living laboratories for broader inception of these technologies and strategies. We have the opportunity to create jobs and increase economic development by leveraging the urban landscape. The IoT, Internet of Things. (or Tress if you ask LA) will allow us to harvest the data and track changes where we can share success through an open source development model. Whether creating a more resilient energy infrastructure, decreasing the stress on our freshwater resources or writing a love letter, all of these approaches can be enhanced through creativity and collaboration resulting in a more stable community: locally, nationally and globally. Originally published at TriplePundit.com on May 6, 2016. A revenue-neutral carbon fee is one strategy to drive change in the private market and to mitigate the detrimental effects of climate change. A book about how organizations can implement environmental sustainability science, theories, and ways of thinking to become more competitive. WFU MAS students strategize environmentally-friendly initiatives for Nespresso to highlight and incorporate into their key marketing strategy.